Behold, the power of the tea! When you don't feel like gulping down an entire energy drink, these little shots shots pack a big punch with a whole 10% actual juice. The rest of it isn't too bad for you either. 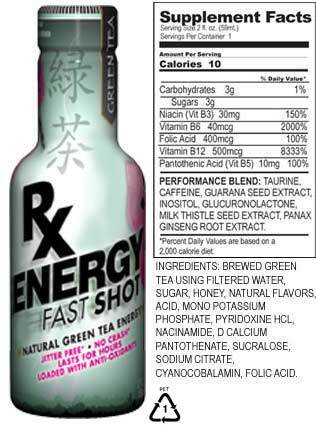 Get the natural benefits of green tea and good-for-you antioxidants in a great tasting, 10-calorie, low-sugar 2 Fl. Oz. Fast Shot made by AriZona. Packed with B-Vitamins and a performance blend, this jitter free, no crash shot will last for hours. Unlike most energy drinks, this is made with no preservatives, no artificial flavors, and no artificial colors.